We don’t know what the people here called themselves. Tlatilco, meaning “place of hidden things,” is a Nahuatl word, given to this “culture” later. Around 2000 B.C.E., maize, squash and other crops were domesticated, which allowed people to settle in villages. The settlement of Tlatilco was located close to a lake, and fishing and the hunting of birds became important food sources. Archaeologists have found more than 340 burials at Tlatilco, with many more destroyed in the first half of the 20th century. Tlatilco figurines are wonderful small ceramic figures, often of women, found in Central Mexico. This is the region of the later and much better-known Aztec empire, but the people of Tlatilco flourished 2,000-3,000 years before the Aztec came to power in this Valley. Although Tlatilco was already settled by the Early Preclassic period (c. 1800-1200 B.C.E. 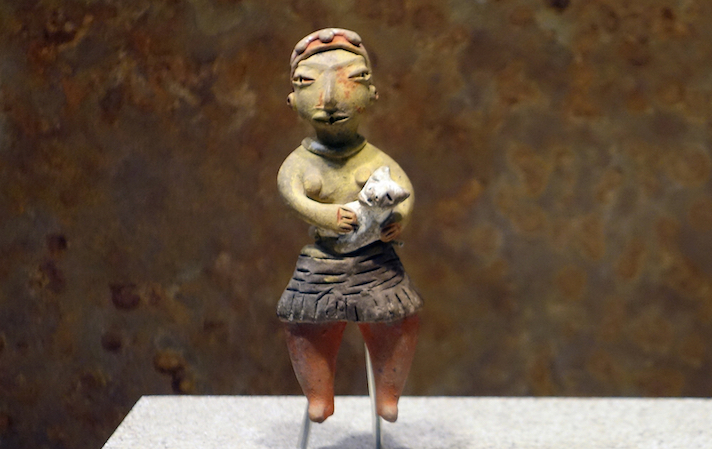 ), most scholars believe that the many figurines date from the Middle Preclassic period, or about 1200-400 B.C.E. Their intimate, lively poses and elaborate hairstyles are indicative of the already sophisticated artistic tradition. This is remarkable given the early dates. Ceramic figures of any sort were widespread for only a few centuries before the appearance of Tlatilco figurines. 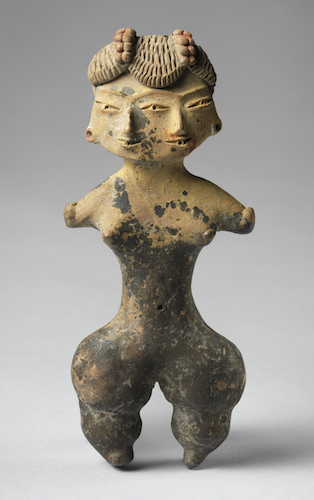 The Tlatilco figurine at the Princeton University Art Museum has several traits that directly relate to many other Tlatilco female figures: the emphasis on the wide hips, the spherical upper thighs, and the pinched waist. Many Tlatilco figurines also show no interest in the hands or feet, as we see here. Artists treated hairstyles with great care and detail, however, suggesting that it was hair and its styling was important for the people of Tlatilco, as it was for many peoples of this region. 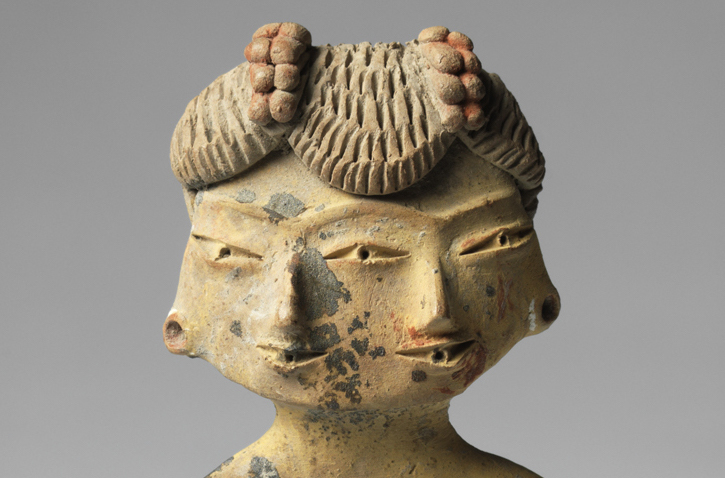 This figurine not only shows an elaborate hairstyle, but shows it for two connected heads (on the single body). We have other two-headed female figures from Tlatilco, but they are rare when compared with the figures that show a single head. It is very difficult to know exactly why the artist depicted a bicephalic (two-headed) figure (as opposed to the normal single head), as we have no documents or other aids that would help us define the meaning. It may be that the people of Tlatilco were interested in expressing an idea of duality, as many scholars have argued. The makers of Tlatilco figurines lived in a large farming villages near the great inland lake in the center of the basin of Mexico. Modern Mexico City sits on top of the remains of the village, making archaeological work difficult. 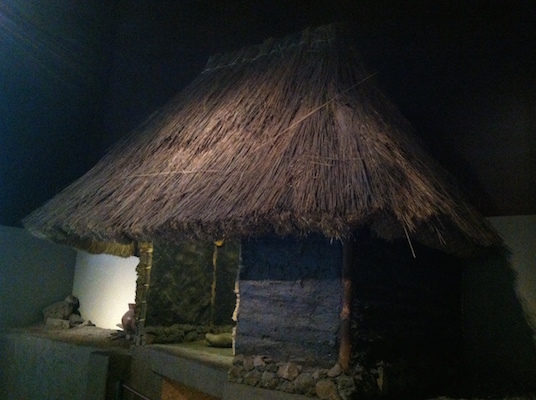 We don’t know what the village would have looked beyond the basic shape of the common house—a mud and reed hut that was the favored house design of many early peoples of Mexico. We do know that most of the inhabitants made their living by growing maize (corn) and taking advantage of the rich lake resources nearby. Some of the motifs found on other Tlatilco ceramics, such as ducks and fish, would have come directly from their lakeside surroundings. Tlatilco artists rarely depicted males, but when they did the males were often wearing costumes and even masks. Masks were very rare on female figures; most female figures stress hairstyle and/or body paint. Thus the male figures seem to be valued more for their ritual roles as priests or other religious specialists, while the religious role of the females is less clear but was very likely present. In the first half of the 20th century, a great number of graves were found by brick-makers mining clay in the area. These brick-makers would often sell the objects—many of them figurines—that came out of these graves to interested collectors. Later archaeologists were able to dig a number of complete burials, and they too found a wealth of objects buried with the dead. 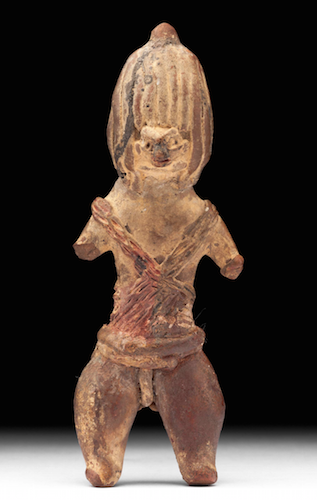 The objects that were found in largest quantities—and that enchanted many collectors and scholars of ancient Mexico—were the ceramic figurines. Unlike some later Mexican figurines, those of Tlatilco were made exclusively by hand, without relying on molds. It is important to think, then, about the consistent mastery shown by the artists of many of these figurines. The main forms were created through pinching the clay and then shaping it by hand, while some of the details were created by a sharp instrument cutting linear motifs onto the wet clay. The forms of the body were depicted in a specific proportion that, while non-naturalistic, was striking and effective. The artist was given a very small space (most figures are less than 15 cm high) in which to create elaborate hairstyles. Even for today’s viewer, the details in this area are endlessly fascinating. The pieces have a nice finish, and the paint that must indicate body decoration was firmly applied (when it is preserved, as in the two-headed figure above). Many scholars doubt that there were already full-time artists in such farming villages, but it is certain that the skills necessary to function as an artist in the tradition were passed down and mastered over generations. Cite this page as: Dr. Rex Koontz, "Tlatilco Figurines," in Smarthistory, August 9, 2015, accessed April 20, 2019, https://smarthistory.org/tlatilco-figurines/.